Mkts weak ahead of Fed meet. The markets on Tuesday continued to consolidate for the second straight day closing with minor losses, amid weak global cues. Mumbai: The markets on Tuesday continued to consolidate for the second straight day closing with minor losses, amid weak global cues. The capital goods, metal and oil shares led the decline. Experts say the market would continue to be volatile throughout this week ahead of the October derivatives expiry on Thursday besides two-day US Fed meet. 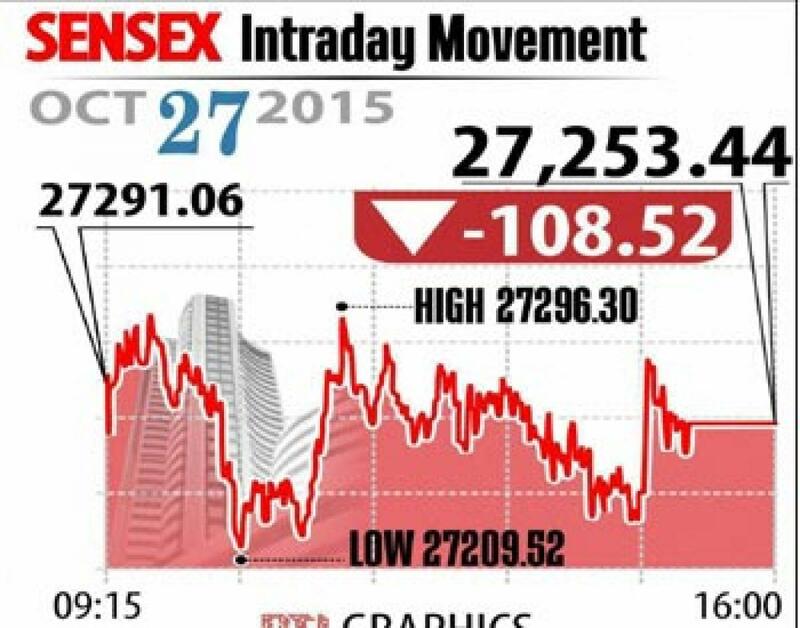 Sensex closed lower by 108 points at 27,253, Nifty down 27 points at 8,232. Meanwhile broader markets outperformed the heavyweights with midcap and smallcap indices up by 0.2 per cent each. Market action on Tuesday was dominated by the mixed corporate Q2 numbers. Maruti closed the day with 2 per cent gain following the company reported 42 per cent raise in the net profit. Other gainers include Sun Pharma, Wipro, HDFC Bank and Bajaj Auto. On the other hand, ONGC, HDFC, GAIL and BHEL were among the losers. On sectoral front, the sectors including consumer durables, capital goods, metal and Oil & gas indices down about 1 per cent each. From auto pack, Hero Moto gained 0.2 per cent as the company targets double-digit growth during the festival period, followed by Bajaj Auto gained 0.4 per cent. The gainers: Maruti Suzuki, up 2.44 per cent at Rs 4,494.60; Sun Pharma, up 1.88 per cent at Rs 905.45 and Wipro, up 1.04 per cent at Rs 575.20. The losers: Lupin, down 5.25 per cent at Rs 1,945.65; ONGC, down 3.07 per cent at Rs 248.10; and HDFC, down 2.87 per cent at Rs 1,275.15.